Google Drive - Have you ever tried to attach a file to an email only to find out it's too large to send? With Google Drive, you can insert files up to 5GB and because you’re sending a file stored in the cloud, all your recipients will have access to the same, most-up-to-date version. Gmail will also double-check that your recipients all have access to any files you’re sending. This works like Gmail’s forgotten attachment detector: whenever you send a file from Drive that isn’t shared with everyone, you’ll be prompted with the option to change the file’s sharing settings without leaving your email. 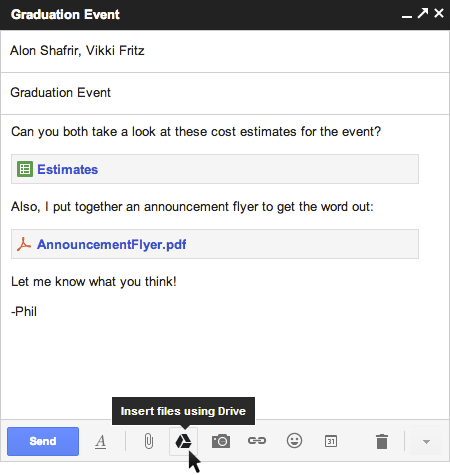 It’ll even work with Drive links pasted directly into emails.